There's nothing new about drive-thru pranks, but you wouldn't know it by the attention the Ghost Car video has been getting. If you're not familiar with it, click the link or ask your mom -- it's that beaten to death already. But it's not even that guy's best drive-thru prank. Perform a YouTube search for other fast food practical jokes and you'll discover that 99 percent of them are tied for the lamest thing you've ever watched. But the pranksters in the following videos -- despite having yet made it onto your Facebook friends' radars -- have Invisible Driver beat by a car length. Static Shock Faint and Slump Ghost Car producer Rahat Hossain has a whole library of drive-thru pranks, topped by this one in which he fakes fainting during payment, slumps over onto the steering wheel, and idles forward as if his foot slipped off the brake. 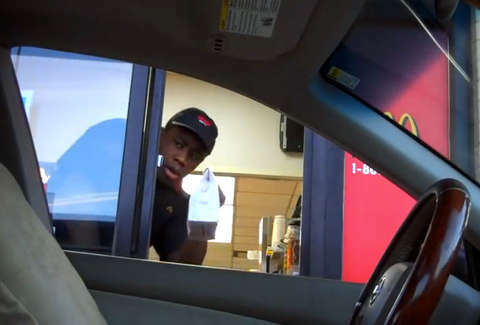 Bottomless Soda Cup Regular drive-thru prankster Jack Vale squeezes four minutes out of a seemingly weak concept when he repeatedly convinces an unbelievably believing window attendant that the soda he ordered was only half-filled. Order Zombie Another drive-thru pranking regular, Ed Bassmaster does a half-assed make-up job good enough to scare the nuggets out of fast food workers on Halloween. Stone-cold E.T. The patience of drive-thru window attendants is exceeded only by that of anyone behind Rush Limbaugh in line for the bathroom. This one indulges an idiot in an E.T. mask, who never breaks his "Stone Cold" Steve Austin impersonation, for three minutes. Jackass Fast Food Football Grab The original drive-thru caper. In it, Ehren McGhehey runs up from behind an awaiting car, takes the sack of unidentified fast food stuffs intended for them like a hand-off from the window attendant and spikes them in triumph.